Saratoga Race Track opens on Friday – get the details on what you can expect for Opening Day, along with six other great events going on this weekend. This weekend rounds out the 175th anniversary of the great Saratoga County Fair, so go enjoy the festivities while you still can! 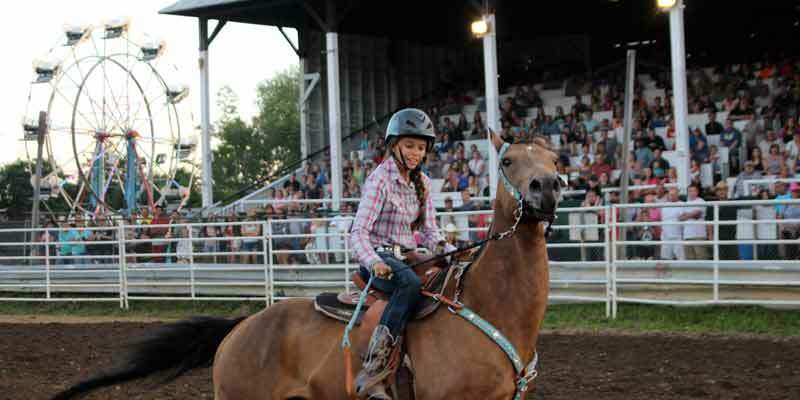 Happening at the Saratoga County Fairgrounds in Ballston Spa, the fair has an amazing line up this year. Check out tractor pulls, live music, a demolition derby, and other awesome events – and of course, the fantastic fair food. What could be better than sipping ice cold, refreshing lemonade on a hot summer day? Painting while you sip lemonade, of course. The Clifton Park-Halfmoon Library is holding a Paint & Sip Lemonade event for grades 6 through 12. Pick an image from an art book to recreate, or express yourself by painting whatever comes to mind. Preregistration is required. This weekend marks the opening day for track season, so don’t miss out on the exciting action going on at the Saratoga Race Track. Also happening on opening day, Taste NY: Craft Beer, which celebrates New York State breweries. Get five samples of craft beer for $5 from noon to five. 4. Performing Arts at the Common: Seussical Jr. Presented by Not So Common Kids, Seussical Jr. – a musical extravaganza with all your favorite Dr. Seuss characters – is performing at the Clifton Common Stage as part of the Performing Arts at the Common concert series. Bring the whole family to this free event for an opportunity to enjoy Dr. Seuss like you never have before. This weekend-long event highlights the start of track season – over 4,000 attendees are expected to flock to downtown Saratoga for Hats Off. Bands will be performing at various locations throughout the downtown area, including Sirsy, Racing City Chorus, and Alan Darcy. Come and check out the live performances and fantastic hats. Plan Ahead Events is presenting this 5K and 10K event at the Corning Preserve in Albany to benefit the Children’s Brain Tumor Foundation. This is a competitive but fun and family-friendly event that allows you to run, jog, or walk the scenic route. There will also be music, food, and an Awards Ceremony for the top racers by age group and teams. The Troy Flea Market is back in Riverfront Park for every second and fourth Sunday through October 23rd. Expect returning favorite vendors along with brand new ones, selling furniture, vintage clothing, jewelry, and more. This week Friends of the Troy Library will be in attendance selling gently used mystery books. Live music will be performed by Dan Sherwin. And food vendors include the Muddaddy Flats, Superior Coffee, Dutch Udder Craft Ice Cream, and Sunhees Farm and Kitchen. For more events happening, check out the full events calendar.